Fall is in the air! 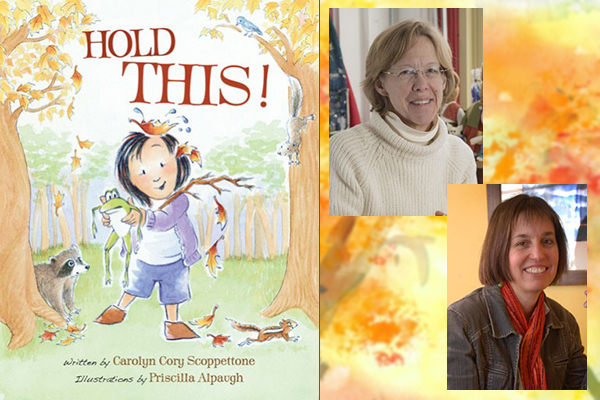 Come join us for a special fall-themed storytime with Carolyn Cory Scoppettone, author, and Priscilla Alpaugh, illustrator of Hold This! They will be reading, answering questions and signing books and we'll provide a special fall-themed craft. A girl and her father go for a walk, experiencing all the sights, sounds, smells, and feels of the woods. As Mika asks her father to hold each and every one of her found treasures, he, in turn, urges her to be a big girl and only carry what she is able to. With every step and stumble, Mika finds both the wonders and treasures of nature, and the ability to pick herself up after a fall. But the true discovery for both daughter and parent comes at the end, when they both realize a true treasure is a hand to hold.